In women’s action, reigning champion Sherry Anderson of Saskatchewan continues to lead the pack in Pool A with a 4-0 record. 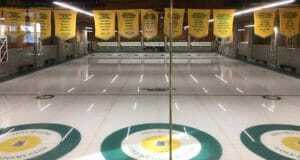 Glenys Bakker’s Alberta rink is close behind with a 3-0 record. The host province, skipped by Marylou Richter, split Saturday’s games with a morning 5-4 win over the Northwest Territories followed by a 6-4 loss to Saskatchewan and slips to third place with a 2-2 record. The real Cinderella story happened in the evening draw of Pool A when Nunavut was victorious over Quebec 9-6. This is the first win for the Nunavut women’s team at the senior championships since the territory has been represented and the tears flowed knowing their hard work is starting to pay off. 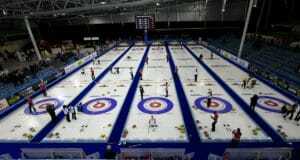 In women’s Pool B, Ontario’s Sherry Middaugh rink from the Thornhill Curling Club stands as the only undefeated team with a 3-0 record after handily beating Manitoba’s Terry Ursel and New Brunswick’s Judy Ross. Following close behind at 3-1 is Nova Scotia’s Nancy McConnery, who picked up a 7-5 win over Newfoundland and Labrador’s Diane Roberts. In men’s action, Saskatchewan’s Bruce Korte tops the leaderboard at 4-0. Korte defeated Northern Ontario’s Al Hackner 7-2 and followed that up with a 7-2 win over Peter MacKey of Nunavut to remain undefeated in Pool A. Right behind Korte, host province British Columbia skipped by Wes Craig and Nunavut’s Mackey both sit at 2-1 after two days. B.C. picked up a huge 9-3 victory over the reigning champions from Ontario skipped by Bryan Cochrane in the afternoon draw. 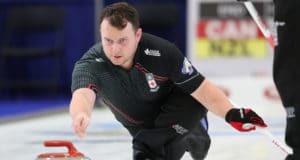 In Men’s Pool B, Alberta’s Wade White sits at the top with a 3-0 record after wins over P.E.I.’s Phil Gorveatt and Nova Scotia’s Brent MacDougall on Saturday. Manitoba’s Dave Boehmer picked up an 8-5 win over Gorveatt and a 7-6 win in the evening draw over Quebec’s Francois Roberge to stay close to Alberta in the standings with a 3-1 record. Not far behind are Nova Scotia and Quebec, both sitting with 2-2 records after two days of round robin play. The round robin in both Men’s and Women’s pool play continues on Sunday with draws at 10:00 a.m, 2 p.m. and 6:00 p.m., all times PT.